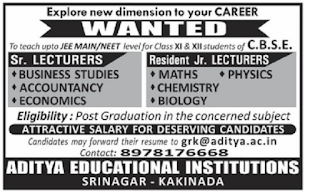 Aditya Educational Institutions, Sri nagar, Kakinada has advertised in THE EENADU newspaper for recruitment of Sr/Jr Lecturers jobs vacancies. Interested and eligible job aspirants are requested to apply immediately.Check out further more details below. 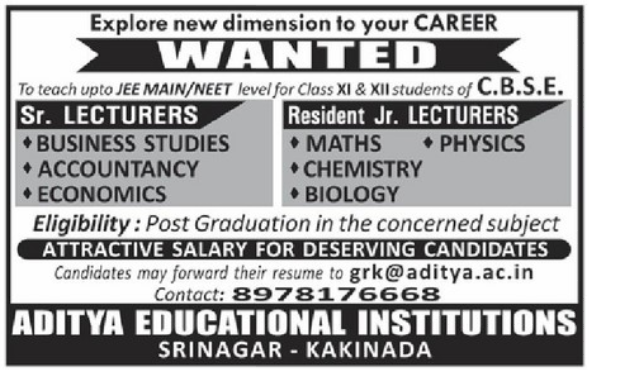 Name of the College : Aditya Educational Institutions, Sri nagar, Kakinada. Post graduation in the concerned subjects.